The first commercial mechanical shearing machinery was sold and installed by Wolseley in 1888. Dunlop Station in New South Wales was the first wool shed to start shearing with these machines. The first demonstration of mechanical sheep shearing in the USA was at the offices of the American Sheep Breeder magazine in Chicago, on Wednesday June 18th 1890 using Wolseley equipment. The Argentina Shearing Machine made by Ward & Payne in the UK was demonstrated in Wyoming in 1893, there were no further attempts to introduce shearing machinery into that country until William Cooper & Nephews became the Wolseley agent in the USA in 1895. Shearing machinery made by the Chicago Flexible Shaft Company was sold under the “Stewart” brand name, in Australia & New Zealand it was sold under the “Cooper” brand name. This is a fascinating and complex history of three companies and how they are connected. Wm Cooper & Nephews in the USA were basically a marketing company of their sheep dip. In 1895 demonstration shearing machinery was taken by railroad around the Intermountain states and setup in feed yards by the railroad. I wonder if engineers from CFS Co traveled with this machinery and set it up? This is a theory I have at this time and I would like to prove or disprove it! The products covered in this time line history range from sheep dip, horse clippers, flexible shafts, sheep shearing machinery, the sale and production of stationary engines, industrial furnaces, car speedometers and accessories, house hold products such the electric iron, the Mixmaster and Sunbeam electric razor. Also mentioned are some of the people who played an important role in the development of these companies. Further details and timelines for the Companies involved are dealt with in detail below, including product such a shearing machines and equipment and stationary engines. © Ron Wiley, May, 2011. Used with permission - Please contact the author on the link below if you wish to reproduce any or all of this history information and explain your case. Type “K” 2hp @ 550 rpm, S/N KA163378. December 1924. This is most likely one of the last engines with the type shown separately from the serial number. Note the type is also in front of the serial number as with later plates. Type “TB” is in front of serial number, this type plate was used until 1948/50 when the last TB’s were sold. The Stover factory closed in early 1942, this type of engine were manufactured by Cooper’s from 1929 although some Stover built engines were imported up to 1936. S/N TB37356 is rated at 2 – 2?hp, they are normally rated at 2 – 2½hp. 1813 - William Cooper born and at age of 20 in 1833 he was farming and practicing as a Farrier like his father and grandfather. In those days a farrier did not mean a shoe smith, but one who practiced has a horse doctor, a castrator and general practitioner in animal ailments. He was in fact, the forerunner of the veterinary surgeon of today. 1843 - Wm Cooper first produced his sheep dip following successful trails in 1841. 1844 - A Royal Charter granted to the College of Veterinary Surgeons and from 1847 Wm Cooper studied there as well as making his sheep dip, he became qualified in 1849. 1848 - Richard Powell Cooper born, his father Henry (b 1820) was the young brother of Wm Cooper. The latter arranged for Richard and his older brother William to go to the Royal College of Veterinary Surgeons and they qualified in 1868 and 1865 respectively. 1865 - William Farmer Cooper’s joins the company that became Wm Cooper & Nephews. 1870/1887 - John K. Stewart and Thomas J. Clark were born in New Hampshire in 1870, it is said that they first worked for J. K. Priest in Nashua, New Hampshire, the maker of horse clipping machinery. They then went to the Brown & Sharpe Mfg Co of Providence, Rhode Island and received the best mechanical training available at that time. 1874 - Charles Timson aged 14; younger bother of Samuel joins the firm. Both of them each worked for the firm for over 50 years respectively and attained high managerial office. 1879 - Henry Harrowell joins Wm Cooper & Nephews as the first “Traveler” (salesman) he and his two Son’s Roland and Shirley were to play an important part in the development of Cooper’s in Australia and New Zealand. 1882 - William Farmer Cooper’s died at the age of 37; Richard Powell Cooper starts his involvement with the firm. 1888/89 - Stewart & Clark took Horace Greeley’s advice to “Go West, young man”. Their first known factory was set up was in South State Street, Chicago and one of the first items they produced were horse clippers. 1890 - John Stewart and Thomas Clark entered a formal company partnership, they produced with aid of two employees barbers hair clippers, fetlock clippers, two hand clippers for horses, bicycle handle bars, and flexible shafts for machine shop use. They had moved to a loft on Canal Street, Chicago. Charles Timson of Wm Cooper and Nephews opens the companies American branch in Galveston, Texas. 1891 – Stewart & Clark’s original company name is unknown, at this time the company name was changed to the Chicago Flexible Shaft Company. They made flexible shafts for industry. 1892 - Henry Harrowell opens the Australian branch of Wm Cooper and Nephews in Sydney, Australia. 1895. City smoke regulations caused problems in the manufacture of a special coal for the “Clark Foot Warmer”. Stewart & Clark found a factory in Aberdeen about 25 miles west of Chicago where they could manufacture the coal. In 1894 the CFS Co were compelled to find new and larger quarters. They were now located in a new fire proof, six story and basement steel constructed building at ? 142-144 Ontario St., where, with greatly increased floor space and modern facilities we are in a much better position to serve their customers than ever before. Wm Cooper & Nephews became the American agents for Wolseley shearing machinery, demonstrations lead to the first sale of this equipment in the USA to a Mr. G. W. Gordon of Soda Springs, Idaho. This was in the autumn of 1895. 1896 In early spring the Wolseley shearing machinery was installed at Soda Springs, Idaho with the Wolseley factory in England sending an engineer to install the shearing machinery. I have a copy of an 1896 CFS Co catalogue for clipping machines all testimonials date from 1895. It is stated in the catalogue that the flexible shaft plant is the most complete for this work of any in the world; our coiling- mill situated on the line of the Chicago & Northwestern R. R., 14 miles from the court house, it is 250 ft long- two stories high and equipped with the most modern labor saving- machinery. 1899/1900 - Charles Timson goes into partnership with John K Stewart to form the Cooper-Stewart Sheep Shearing Machinery Co; this company markets the Stewart shearing machinery in the USA. Around this time Wm Cooper & Nephews relinquish the US Wolseley agency. 1900 - It was found that there was a need to produce shaper and longer-lasting blades for the barber clippers, horse clippers, and shearing combs. John K. Stewart worked with an Ed Larson to build a very efficient heat-treating furnace to temper blade steel to achieve better quality and longer lasting blades. In August of that year L. H. LaChance the nephew of John K, Stewarts wife joins the Chicago Flexible Shaft Co and is sent to London to open a branch office of the company. 1902 - The Cooper Sheep Shearing Machinery Pty Ltd was set up in setup in Australia in 1902 under the instructions of Wm Cooper & Nephews, Chicago USA. The new company was located in a small store in Viceroy’s Chambers, Pitt Street, Sydney, with the first manager being a Mr. T. W. Sands and Mr. Hughes was the accountant. They sold Stewart shearing equipment under the brand name “Cooper” and were also the NSW & New Zealand agents for Fairbanks Morse engines. The Chicago Flexible Shaft Co erects a building of eight stories and basement on the southwest corner of LaSalle & Ontario Streets. 1903 - L. H. LaChance returns from London and Michael William McArdle joins the company as the advertising man, he was to become a Vice President and then President of the company. They were to play an important role in the development of the Chicago Flexible Shaft Co in the next few years. 1904 - Charles Timson and his son Charles Jnr of Wm Cooper & Nephews (USA) became associated with the Chicago Flexible Shaft Co when a 50% interest in the Company is sold to Wm Cooper & Nephews. The Sterk Mfg Co set up to make automobile accessories and the first accessory made was a siren or a horn. 1905 - The Stewart & Clark Mfg Co is set up and acquired the assets of the Sterk Mfg Co, they moved from Wells Street to a new factory on Diversity Parkway. This was to become the corporate headquarters of the Stewart-Warner Corporation. The Chicago Flexible Shaft Co was said to be the predominant maker of shearing machinery in the USA at this time. 1906 The Stewart & Clark Mfg Co start to manufacture speedometers. 1907 - Thomas J. Clark fatally injured on July 15 when his Packard Automobile over turned, he was demonstrating the Stewart speedometer on the Glidden Tour of that year. The Chicago Flexible Shaft Co erects a new factory along side the existing one, increasing space by 100%. They produce tremendous quantities of flexible shafts to connect Stewart speedometers to the front wheel of cars. The Warner Instrument Co of Beloit, Wisconsin was formed. A 1907 Catalogue shows the Cooper Sheep-Shearing Machine Agency of 24 Swanson Street, Auckland as New Zealand agents, district agents were Donald & Sons of Masterton, T. H. Carverhill of Christchurch and Williams & Kettle Ltd of Napier. 1908 - Shortly after the loss of Mr. Clark, John K. Stewart sold his remaining 50% interest in the Chicago Flexible Shaft Co to the Cooper’s and John K. Stewart devotes his entire time to the growing Stewart & Clark Mfg Co. At this time L. H. LaChance was elected President of the Chicago Flexible Shaft Co and M. W. McArdle general manager. The Cooper Sheep Shearing Machinery Co move to 16 Young St, Circular Quay and Hughes succeeded Sands as manager. 1909 - In August of that year The Cooper Sheep Shearing Machinery Proprietary Ltd of 16 Young St, Sydney wound up by Wm Cooper & Nephews. Then at the beginning of September Richard Powell Cooper and his eldest son Richard Ashmole Cooper register the Cooper Engineering Co at the same address. After some years of experimentation with die casting an eight-story building was built on Wells Street, Chicago. The Stewart Manufacturing Co is formed to make and sell die-castings and their principal customer was the Stewart & Clark Mfg Co who required die-castings for speedometers. 1910 - Under the direction of LaChance & McArdle the Chicago Flexible Shaft Co starts to diversify with production of their first household appliance, the Princess Electric Iron. The CFS Co plant was in an area with a large number of small manufacturing plants, near the north side of the Chicago River. From the early 1900’s they made special heat treatment furnaces at the request of these local companies, as the need for furnaces equipment grew the Stewart Industrial Furnace Division was formed in 1910. 1911 - At sometime between 1911 and 1912 the Cooper-Stewart Engineering Co was set up in the UK, they took over from the Chicago Flexible Shaft Co in selling Stewart shearing equipment. They were also the UK agents for Stewart speedometers and possibly making them under licence? 1912 - Charles Timson’s son Charles Eldred Timson takes control of Cooper interests in the USA. In the 1926 Stewart-Warner annual report it is said that in 1912 the Stewart & Clark Speedometer Corporation was constituted as public company to succeed the business started in 1906. In early 1998 Maxima Technologies acquired Stewart-Warner, the early company history states that in 1912 John K. Stewart & Edgar Bassick joined forces to create a new company to manufacture vehicle instruments and horns. Around this time a Mr. Ennson became manager of Cooper Engineering. 1913 - Sir Richard Powell Cooper died in 1913 at the age of 65, with his son Richard Ashmole Cooper inheriting the business from his father. Charles Timson returns to England to become Chief Executive of Wm Cooper & Nephews. In mid 1913 the Stewart & Clark Speedometer Corporation takes over the Warner Instrument Co to form the Stewart-Warner Speedometer Corporation. William George Hodge an English engineer was appointed manager of Cooper Engineering. 1914 - Towards the end of 1913 Horace Caldwell Wright formerly a buyer of the great Chicago hardware firm of Hibbard, Spencer Bartlett & Co was ask to go to Australia and manage the Cooper Engineering Co. At the beginning of 1914 Mr. M. W. McArdle arrived in Australia with Mr. H. C. Wright. William G. Hodge becomes the assistant manager of company. Mr. McArdle stays on in Sydney for a few weeks and an intensive advertising campaign is carried out to increase the sales of machinery. This looks to explain the December 1914 ad in “The Pastoral Review”, see comment under Fairbanks Morse engines, In August of 1914 Roland Harry Harrowell, who was the Livestock editor of the Livestock Australasian Pastoral Review and the son of Henry Harrowell, became the Sydney manager of Wm Cooper & Nephews. 1915 - In June 1915 the Cooper Engineering Co Ltd, Sydney, was registered with 10,000 one pound fully paid shares. 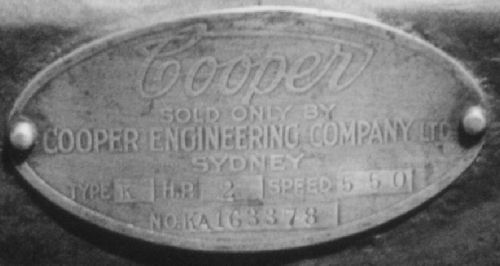 The control of the Cooper Engineering Co Ltd, Sydney, was sold to the Chicago Flexible Shaft Co with them acquiring 9.993 shares from Richard Ashmole Cooper. The Directors were H C Wright (managing director), Roland Harry Harrowell and L. H. LaChance. 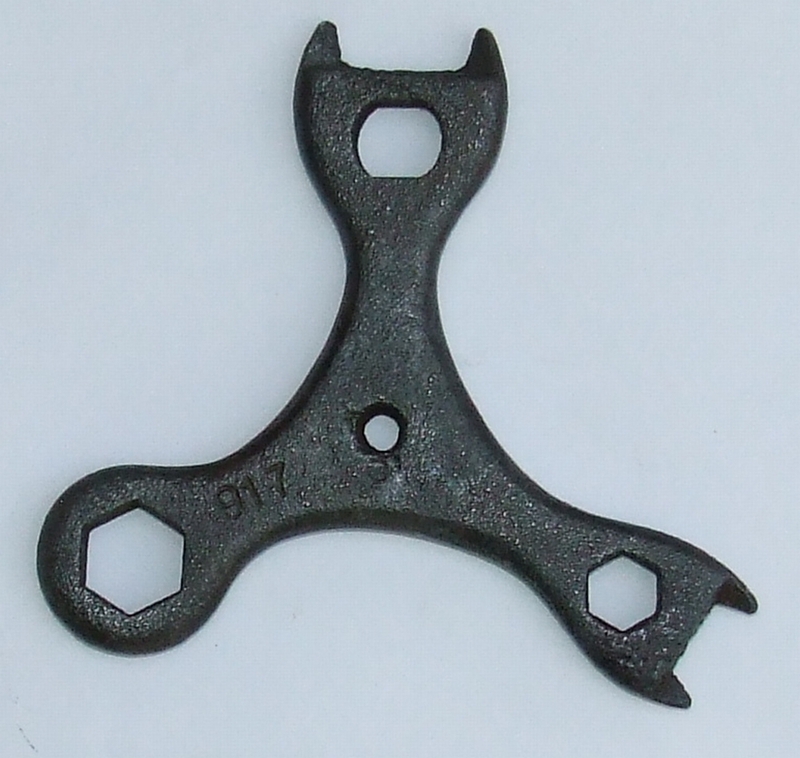 The Cooper Engineering Co sold 1906 models of Friction Pattern Overhead Shearing Machine that proved unacceptable to the Australian shearer’s, so a belt driven overhead gear driven was developed in Australia and named THE COOPER NEW SILENT BELT DRIVEN OVERHEAD GEAR was sold from this time. With the low exchange rates and advancing tariffs, the wheels, brackets and grinders were made in Sydney. Over the years, pumping plants for irrigation, chaff cutters; saw benches and orchard sprayers were added to the lines sold, the reason for this being was to increase the sales of engines. In the Australasian Hardware and Machinery Magazine of April 1915 it is stated that Cooper Engineering Co had set up a Melbourne branch, at 548-90 Elizabeth Street. The manager was a Charles Abraham Cooper; he would seem to be a member of the Cooper family? The branch was set up before only two months before the Chicago Flexible Shaft Co took control. Later in the year the Melbourne branch is shown at 486 Collins St, with Mr. William G. Hodge as the manager. The Cooper Engineering becomes the Australian distributor for products of the Stewart-Warner Speedometer Corporation and then later for the Stewart phonograph made by the Stewart Manufacturing Corporation. These agencies were terminated after several years of operation. 1916 - John K. Stewart died in June 1916 at the age of 46. The Cooper Engineering Co moves to a larger four-story building at 129-131 Sussex Street, Sydney. 1918 - In January edition of In the Australasian Hardware and Machinery states that Horace Caldwell Wright (MD), Roland Harry Harrowell, L. H. LeChance and William George Hodge are the Directors of Cooper Engineering Co Ltd Roland Harry Harrowell becomes the Managing Director of the Australian branch of Wm Cooper & Nephews at this time, a position he was to hold for the next 33 years. 1919 - William G. Hodge resigns a Melbourne manager and is replaced by Mr. W. G. Blackstone. 1919/1920 - The Carbarita works of Wm Cooper & Nephews was built in Hen and Chicken Bay on the Parramatta river, It is interesting that barges were use to carry sulphur and arsenic to the whafe at the factory from cargo ships in Sydney harbour, there is a parallel to Berkhamsted in the use of barges for the same purpose. The Ottery mine was purchased in 1920, it was at Tent Hill, via Deepwater (near Tenterfield), NSW. It was a tin mine, but it could also yield arsenic. The output from the mine was used to supply the new Carbrita factory for the production of sheep dip. 1921 - The Sunbeam Home Appliance division formed by the Chicago Flexible Shaft Co, the “Rain King” series of garden sprinklers added to the range of products. Henry Harrowell dies at the age of 75. 1922 - In that year the Melbourne branch moved to Spencer Street on the corner of Jeffcott Street. Electric hot plates added to the Sunbeam home appliance range. 1923 - The Managing Director Mr. H C Wright returned to Chicago to become firstly, Vice President, then President and finally Chairman of Chicago Flexible Shaft Company. A Mr. G Ferguson who had been with company for twelve years and was assistant manager at the time was appointed the Managing Director. 1927 - In that year the Melbourne branch moved to Little Bourke Street. The “EB” shearing handpiece is released, “EB” is thought to stand for Ed Bartlett. Ad in New Zealand Farms shows The Cooper Engineering Co (N.Z.) Ltd, I have no information as too when this company replaced the Cooper Sheep-Shearing Machine Agency. 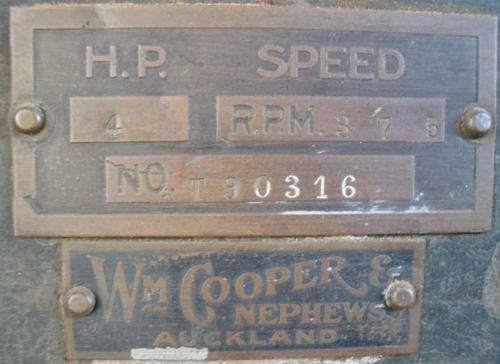 Five Cooper (Stover) Type KA have come to light that were shipped to New Zealand between 1926 & 1930, all of them have Wm Cooper & Nephews, Auckland plates. Shirley Harrowell brother of Roland was Managing Director of Wm Cooper & Nephews New Zealand; I have very little information about Cooper’s in N. Z. prior to WW2. 1929 - Coffee makers added to the Sunbeam home appliance range. 1930 - The “Sunbeam Mix Master”, waffle irons, electric clocks added to the Sunbeam home appliance range, Cooper Engineering the agents in Australia. 1931 - An electric razor and fans added to the Sunbeam home appliance range. 1932 - A drop in the value of the Australian pound in relation to the US dollar made it unprofitable to sell machinery that was imported from the Chicago plant. Mr. C. H. Brookes from the Chicago plant was sent to Sydney too assess the situation and it was then decided to establish an Australian manufacturing plant, to achieved this objective a 28,000 square foot building was purchased in Elizabeth Street, Waterloo, Sydney. 1933 Production machinery was sent from Chicago to Sydney in late 1932 and beginning in early 1933 alterations were made to the factory and the production machinery was installed. This was achieved in a period of ninety days and local production of Cooper shearing equipment started. 1934 - Mr. C. H. Brookes who had been production manager at head office, Chicago plant, arrived in Sydney. He came to supervise the setting up of repetition production methods for the manufacture of shearing machinery. He also set up programs that were new to Australia at that time in the use of standard analysis of costs and time studies of the manufacturing operations. Along with this he made very noticeable in improvements the quality of comb’s and cutter’s by altering manufacturing methods. The manufacture and sales of the Cooper “Master Model” Friction overhead Gear was also started at this time. This was to become in a short period of time, one of the company’s best-known and continuous selling lines. Local production of the “EB” handpiece had started in 1933 Wm Cooper & Nephews sell the Ottery mine in 1934 to the Anglo-Malayan Co who reverted it back to a tin mine. 1935 - Mary Brooks comes to Australia with her husband Cyril (C. H. Brookes) and becomes Cooper’s advertising manager. Prior to this she was the advertising manger and personal assistant to Mr. M. W. McArdle, the President of Chicago Flexible Shaft Co. About eighteen months after starting these programs, the number of employees of the company had more than doubled, This was at the time of a world wide depression and the Cooper Engineering Co Ltd was one of the few Australian companies that continued to expand it’s workforce. 1936/37 - This time saw the consolidation of the company with increased sales through the installation of new and more modern machinery and the improvement in manufacturing methods. The increase in the number of employees continued at this time on a steady but firm basis. 1937 - The Cooper family shares in the Chicago Flexible Shaft Co were gradually sold over a period of years to the American Co-president of the company until he had complete control in 1937. Cooper Engineering Co Ltd was now a wholly owned subsidiary of the American owned company. Mr. C. H. Brookes becomes the Managing Director of Cooper Engineering; Mr. G. Ferguson replaces Mr. W. G. Blackstone as Melbourne manager, the latter takes charge of advertising at head office. 1939 - The Waterloo factory was becoming too crowded and land was purchased at Mascot to allow the continued expansion of the company. 1941 - The company produced the first electric powered shearing gear; it was based on the friction cone drive. 1942 - Cooper Engineering moves into the new Mascot plant and the major part of production swung over to war work. 1944 - Mr. F. N. Yardwood dies; he had been chairman of the board of Cooper Engineering since 1922, Mr. R. H. Harrowell appointed chairman of the board. Late in that year experimental work on sheep showers commenced, various types of nozzles, mechanisms and enclosures were tried under actual working conditions on a property in New South Wales. 1946 - The Chicago Flexible Shaft Co decides to change it’s name to the Sunbeam Corporation because it was better known by that time for it’s household products, Cooper Engineering South Australian Branch open in 1946 in Waymouth Street, Adelaide with Mr. F. A. Burrows as manager. 1951 - Mr. R. H. Harrowell dies after a short illness, he his succeeded by Mr. C. H. Brooks the managing director of Cooper Engineering since 1937. 1952 - The Cooper Engineering Co changed its name to the Sunbeam Corporation in December of that year. At this time construction was started of the huge complex at Campsie, New South Wales. Queensland branch opened at 15 Logan Street, South Brisbane with Mr. A. S. Lesley as manager. 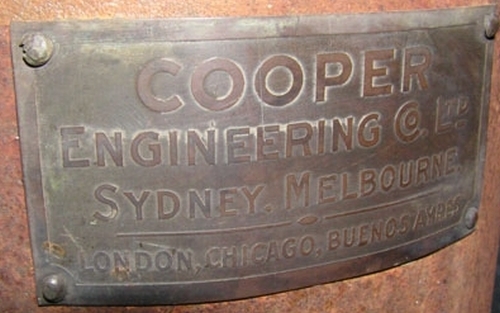 Cooper Engineering closed in New Zealand, the companies shearing machinery and engines was marketed through the firm of Wright Stephenson & Co of Wellington. 1960 - Cooper, McDougall & Robertson Limited were taken over by Burroughs Wellcome & Company. 1967 - Mr. C. H. Brooks retires and is replaced as managing director by Mr. Merv Doherty. 1970 - Sunbeam purchases VICTA lawn mowers. 1971 - Mr. Merv Doherty becomes Chairman of the board of the Cooper Engineering Co and Mr. Roy Jenkins becomes managing director. 1984 - Victa becomes an integrated part of Sunbeam when the company relocates from Milperra to a new factory at Campsie. 2000 - Cooper’s Animal Heath now owned Shearing Plow, with John Haigh as the manager. He started working for Wm Cooper & Nephews in 1956 and retired in 2002, he was a great help in finding the early history of Wm Cooper & Nephews. 2002 - SUNBEAM VICTA was sold to Trutest of New Zealand. 1902 to 1916 - NSW & New Zealand agents for Fairbanks Morse horizontal and Vertical engines. Most of the engines found so far are Type “T” verticals, only 2 Type “H” and 1 Type “N” horizontal have come to light. 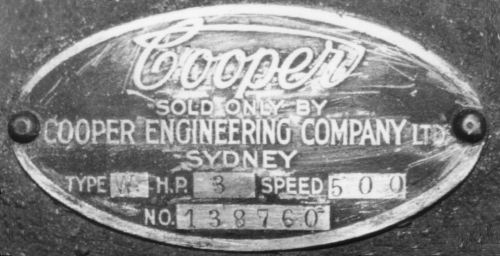 Engines sold prior to September 1909 have The Cooper Sheep Shearing Machinery Proprietary Ltd on the plate, after that time a new company was formed, the Cooper Engineering Co. I thought Cooper’s were the NSW agent but a December 1914 ad in “The Pastoral Review” looks to show they are agents for mainland Australia, no mention of this in the ad? The ad lists the following engines and says they can be shipped from all mainland capitals plus Rockhampton and Townsville in Queensland. Larger engines have self-starter plus electric ignition and “Hot Tube” for emergency. The use of “Hot Tube” is said to have stopped in 1906 but this feature was still fitted to engines for Australia in case as the ad says the electric ignition fails. 12hp horizontal - type “N”, portable only As far as I know hopper-cooled versions of the above horizontal engines were not sold in Australia? Note 1 - type “T” applied to stationary models; the same engine mounted on skids was called the “Jack of all Trades”. Type “T” - first produced 1900, production ended in 1916 The latter information comes from “American Gas Engines since 1872 “ by C. H. Wendel. 1905 - the Stewart “Little Wonder” two stand portable shearing machine was first produced and sold by the Chicago Flexible Shaft Co. It was sold in the UK by the Chicago Flexible Shaft Co of 22 Denman Street, London and in Australia as the Cooper “Little Wonder”. The 1905/06 models look to have cast iron hopper and battery ignition. 1907 - The Cooper “Little Wonder” two stand shearing machine on show at the Melbourne Royal Show, it now has the familiar sheet steel water tank, chain driven magneto and 11 inch solid flywheels. 1910 - The “Little Wonder” now has gear driven magneto. 1914 - Late in that year the crankcase is redesigned and 14 inch spoked flywheels are now used. 1923 - The “Little Wonder” goes out of production at this time. Sold as two stand portable shearing machine throughout its production life but from 1916 it was sold as a stationary engine without the shearing gear. With one option it was attached to a pump jack. 3½ inch bore & stroke, 2hp @ 750rpm. This is an air-cooled engine with a 2½”x 2¾” bore and stroke; it was originally rated at ½hp at 750 rpm. By 1917 it was rated at ¾hp, how this increase was achieved is unknown. It was either by enlarging the bore size or increasing rpm. It has a float type carburetor, gear driven high-tension open horseshoe type magneto and hit & miss governing. Advertised in the Cooper’s Sheepman’s Diary of 1917 as a Cooper “Little Major” single stand portable shearing plant. This would seem to be a larger version of the “Little Wonder”? Magneto Gear driven high-tension open horseshoe type. The only picture and information about the engine I have found is on page 97 of C. H. Wendel’s American Gasoline Engines since 1872. Water-cooled two or four-cylinder vertical engines manufactured in Coventry, England. 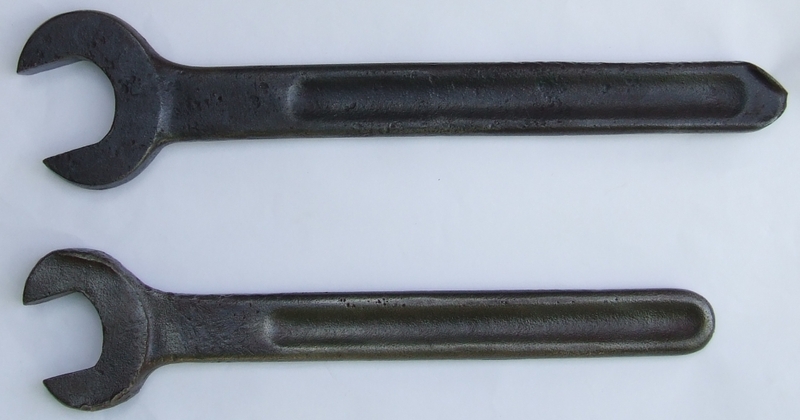 A single casting of two cylinders with non-removable heads is used; the four-cylinder engine has two sets of cylinders bolted to a common crankcase. Features; Bosch high-tension magneto, bronze cooling pump, automatic lubrication, centrifugal governor connected to carburetter throttle slide and all gears are enclosed and run in oil Apart from a 1916 ad I have no information about how long these engines were sold? The following engines were referred too as the “Cooper Engine”; there was no reference to the Stover Engine & Mfg Co of Freeport, Illinois, who produced them in any ads. Stover Verticals – types 4hp type YB & 6hp type YC. A March 1917 ad shows a Stover Vertical engine that is referred too as the “Cooper Engine”, it also states these engines have been sold for the last 10 years (1908). The earliest Cooper badged Stover found to date, was shipped in 1910. A Stover 4hp ‘YB’ S/N 96192 looks to be the first engine shipped directly from the Stover factory on 8/8/1917 to the Cooper Engineering Co, San Francisco. These vertical engines do not look to have been sold after 1918? Type “K” 1 hp @ 525rpm rerated to 1½hp in April 1913 from S/N 49885. Supplied with the following options, tank or hopper cooled, will run on either petrol or Kero and either hit & miss or throttle governed. Type “KE” 1½hp @ 600 rpm, 3?” bore x 3½” stroke, 15" flywheels. Hopper cooled, run only on petrol and only hit & miss governing. The following engines were hopper cooled, they could be supplied too run on petrol or Kero and either hit & miss or throttle governor. Type “KA 2hp @ 575 rpm, 3½” bore x 5" stroke, 17" flywheels. Type “KC” 6hp @ 450 rpm, 5¾” bore x 8” stroke, 30” flywheels. Vertical water-cooled side-valve engine, it was first released in April 1928 by Stover with either hopper, tank or radiator cooling. This engine had ball race main bearings and a 2¾ inch bore by 4 inch stroke, According to Charles Wendel only 824 of these engines were built, one of these engines has been found in Australia with an oval Cooper plate with the following information. The S/N 199833 dates from late 1928, the configuration of pulleys and flywheel make me think it was tested on a portable two stand shearing plant? Later versions had a 2? inch bore and were rated at 3½ - 5hp. This engine is undergoing restoration in 2008. Type “TA” 1½hp @ 600 rpm, 3¼” bore x 4½” stroke - 16" solid flywheels. Hopper cooled, run only on petrol and only hit & miss governing. The following engines were hopper cooled, they could be supplied too run on petrol or Kero and either hit & miss or throttle governed. Type “TB” 2hp @ 575 rpm, 3½ inch bore x 5 inch stroke – 17 inch solid flywheels. Type “TC” 3hp @ 575 rpm, 4¼ inch bore x 5 inch stroke – 19 inch flywheels with six holes. Type “TD” 4hp @ 550 rpm, 4¾ inch bore x 6 inch stroke – 21 inch flywheels with six holes. Cooper’s started to make the types TA & TB in Melbourne from 1929, only the frame & cylinder casting came from Stover all other engine parts were made in Melbourne. The Wico “EK” magneto was also imported from the USA. It is possible that some TC’s were also made in Melbourne but none have come to light. The TD was imported in small quantities but again none have come to light. Sales of engines & machinery picked up dramatically in 1934, 1935 & 1936 and batches of 100 type TB were imported from Stover to supplement local production to meet supply, a small number of TC’s were also imported. Copper’s continued to produce the 2hp type TB until 1950, although the Stover factory had closed in 1942. Little is known about these engines except for one being shown in a Cooper catalogue for 1925/26 (5hp model). They are referred too as the Cooper vertical petrol engine that was made in England; I only have three pages from an Instruction/Parts book. It would seem they were sold from around 1919 to 1925/26 to replace Stover verticals? Similar in appearance to the Stover but with a chain driven high-tension rotary magneto mount on a crankcase inspection cover and hit &miss governing. A “Shutter Type Carburetter” fitted to the 2½ - 3hp model and “Automatic type Carburetter fitted to the two larger models, no other information available. There are three models as shown below. 2½ - 3hp, 40 gallon cooling tank recommended. 4 -5hp, 70 gallon cooling tank recommended. 7 - 9hp, 90 gallon cooling tank recommended. In 1934 Cooper’s badged Southern Cross petrol & diesel engines started to be sold. Type PD – 8hp @ 600, twin cylinder (two 4hp cylinders on common crankcase). The 4hp type N was released around 1943, as far as I know none were sold with a Cooper badge. Cooper released the 3hp type XC and 4hp type XD in late 1945, from that time they only sold the 2hp Type N until 1952. Type “NRA”, air-cooled version of the 4hp type “N”, 3¾ inch bore by 3½ inch stroke, 5 to 8hp @ 1,000 to 1,700 rpm. Listed in 1960 most likely replaced by the Wisconsin Model AENLD in 1965. It looks as if Wisconsin either partly or fully owned Ronaldson Tippet from the mid 1960’s? By this time the Ronaldson Tippet engines were phased out and the following air-cooled Wisconsin petrol engines were listed Electric starting an option with combined starter-generator. The above information comes from Sunbeam Rural Division, “General Price Lists”. I do not have the 1972 list and the 1973 list no longer shows any engines listed except for the 3hp Kirby that was supplied driving a pump, compressor or crutcher. These engines came on the market in 1935 with the X100 model; in 1938 Cooper’s started to use the X416 on their new “SF” (Small Flock) portable shearing plant, in Cooper ads they were referred too as the Johnson Iron Horse. In December 1941 The USA entered WW2 after the Japanese attacked Pearl Harbor. From 1942 Cooper Engineering started to product these engines and direct drive 12 vdc generators or the Australian and US military. 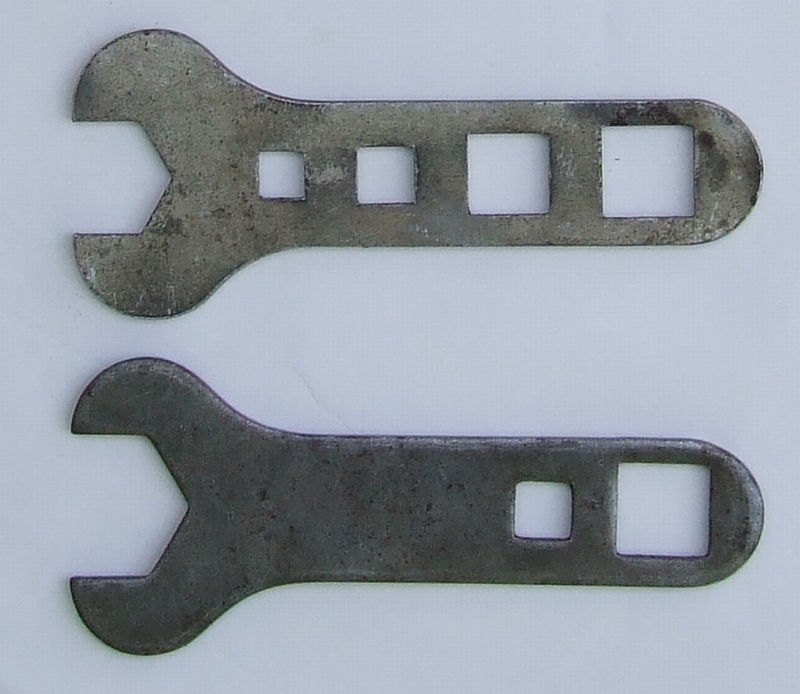 Cooper type “JM” with 2? inch bore & 1½ inch stroke, 5/8hp @ 1800 rpm, Johnson X400 type engine. No generators have found with Cooper plates made between 1942 & 1944, however two TADCO (Thorn & Dean of Melbourne) badged generators type RVE have turned up dating from 1944. Wartime generators found to date are the types CH1 – 395 – 5 and CH1 – 395 – 6 with Outboard, Marine & Manufacturing Co of Canada plates, this was the parent company of Johnson & Evinrude. X500 type engines with a 2¼ inch bore & 1½ inch stroke. Type “RV” 1hp @, 2,100 rpm, suction carburetter and engine mounted on cast base incorporating fuel tank. Type “PT” 1-1/3hp @ 2,400 rpm, float type carburetter and gravity feed fuel tank. In 1957 the RV became the “RB” and PT became the “PB”, the new engines had ball race instead of plain bronze bush type main bearings. Cooper badged direct drive 12vdc generators were produced for civilian use from 1945 to the mid 1950’s, 24vdc & 32vdc versions were also available. These were also badged as Breville & TADCO units. Thorn & Dean were an electrical company and I wonder if they made the generators for Cooper’s? The RB & PB were last listed in 1965 only on the “Small Flock” single stand and “Little Wonder” two stand portable shearing plants. The “Little Wonder” name was used on shearing plants for 60 years. From 1945 Cooper’s produced two new 3 & 4hp engines to replace the Ronaldson Tippet made engines, were available as either tank or hopper cooled. Type “XC” – 3hp @ 900 rpm, 3½ inch bore by 3½ inch stroke. Type “XD” – 3hp @ 1,100 rpm, 3¾ inch bore by 3½ inch stroke. These “XC” was not listed in 1965 and XD” was listed until 1967. 3hp Kirby-Tecumseh type HK30 four-stroke petrol engine. This engine is listed in 1970 supplied with a pump, compressor or crutcher. In 1975 single stand and two stand portable shearing plants with 3hp Kirby-Tecumseh four-stroke petrol engine. Pump and compressor still listed with Kirby engines. Single stand and two stand portable shearing plants with 3hp Kirby engine still listed in February 1980. This the latest information I have, no other engines are listed after 1971? Type “YB” 3hp @ 900 rpm, 3½” bore x 4½ stroke. Type “YC” 4hp @ 600rpm & 6hp @900 rpm, 4½ bore X 5½ stroke. Cooper badged Ronaldson Tippet diesel engines were sold from 1937 to 1971 when R & T stopped making engines. I have gleaned the information below from my catalogues, any additional information would be useful on these engines as they are not that common. Model “LCA”, 2 - 5hp, 1965. Model “LK”, 75mm bore by 100mm stroke (440cc) 4 - 7hp @ 1,500 to 3,000 rpm (Continuous output), electric starting an option. Fairbanks Morse These are dated by the engine serial number; no factory records exist for engines made prior to 1911. I have seen one vertical with a date 3/5/3 (March 5, 1903) stamped on the cylinder, engine S/N 49295, this the earliest engine I know of. No serial numbers are stamped on these engines making dating very difficult. These are dated by the engine serial number. Cooper badged versions of these engines still had Southern Cross serial numbers, I have some dating info on these engines so contact me. 1234 – engine serial number, at the beginning of each year they started with S/N 0001 irrespective of engine type. Other engines like an RV would a serial number like 540321 this is engine No 321 of 1954. Engines with low serial numbers built between 1943 & 1949 could something like 4321, engine No 21 of 1943, the two zero’s before 21 were not stamped on the plate. Type JM, only three known to exist. S/N’s start with 37 for 1942, 43 for 1943 & 44 for 1944, replaced by the type RV in 1945. Please contact me for dating information on other Cooper badged engines. Can you send me the type and serial number of any Cooper engine you have so it can be entered on the register, this information is slowly giving a picture of what engines still survive. ©Ron Wiley, May, 2011 Used with permission - Please contact the author on the link below if you wish to reproduce any or all of this history information and explain your case.